Can we just talk for a minute about how perfect Italian beef sandwiches are? I mean, I know I do it all the time, but I just can’t help it. They’re. Just. So. Good. J and I had taken the kids to Naperville to the DuPage Children’s Museum to give Nana and Grandpa a break from us. It was a crappy, rainy day and we didn’t want to stay cooped up in the house so we went for a drive. We had a great lunch at Q-BBQ then headed back to watch movies with Grandpa. When dinner rolled around, I asked everyone if they wanted to try that new chicken sandwich place. Everyone was on board…but….they closed early for a staff meeting. J and I were stuck sitting in the parking lot and didn’t know what to do for dinner. 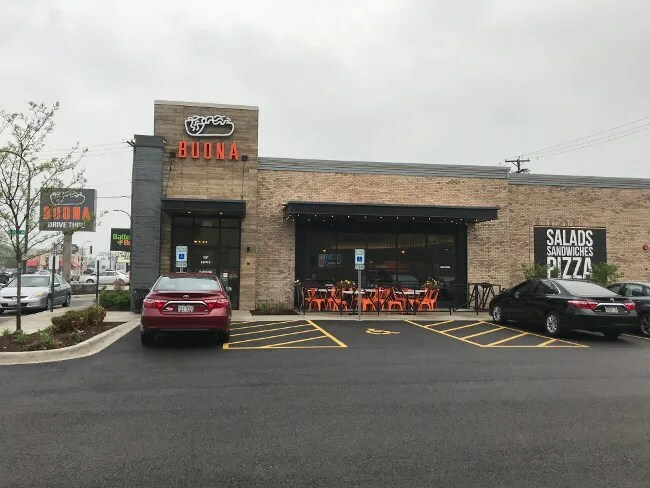 Buona’s Oak Lawn location is on 95th Street just a few blocks east of the Ridgeland Avenue intersection. This new construction building is jammed on to a plot of land that used to be a couple of houses as recently as 2016. Buona has it’s beginnings in Berwyn at a small shop that is pretty common for this kind of food. They’ve grown quite a bit over the last thirty plus years in to a full fledged regional chain. 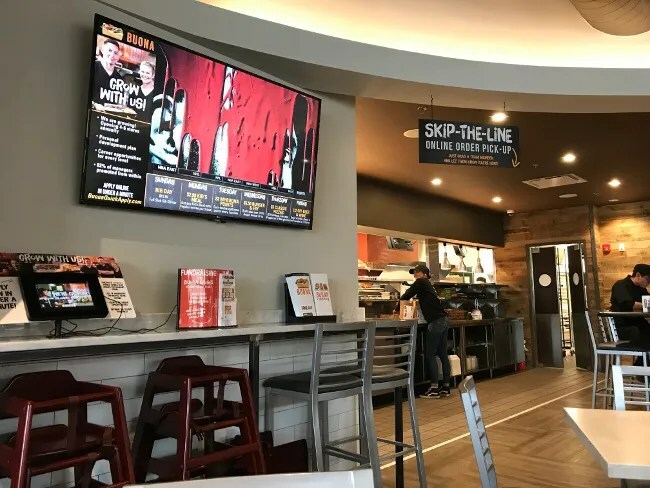 The stores all look and feel mass produced with clean lines, lots of natural light, TV screens showing sports, and matching tables and chairs throughout the space. 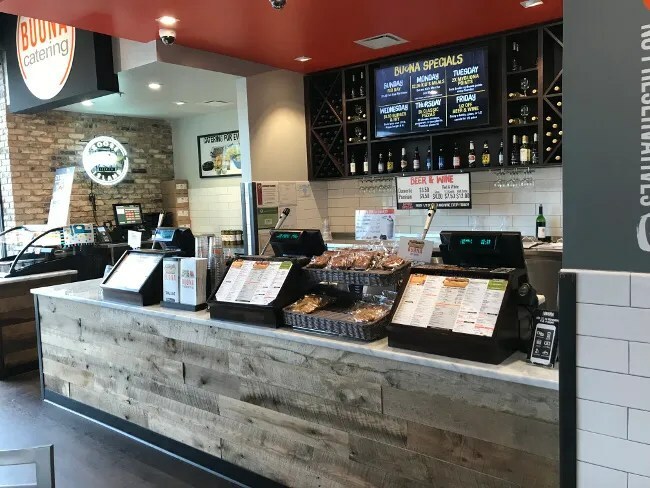 Ordering at Buona is just like ordering at any other fast food restaurant….sorta. I mean, you have to know the lingo, but there’s an order counter just inside the door with menus sitting in front of the cash registers for those who want something other than a beef. J and I put our orders in then took a seat near the pick-up area. We were given a number to put on the table and once the order was ready, it was brought out of the kitchen and handed to us. It’s not secret what I ordered. I got the Italian beef “baptized” with hot peppers. Buona has quickly become one of my favorite Chicago Italian beef sandwiches. 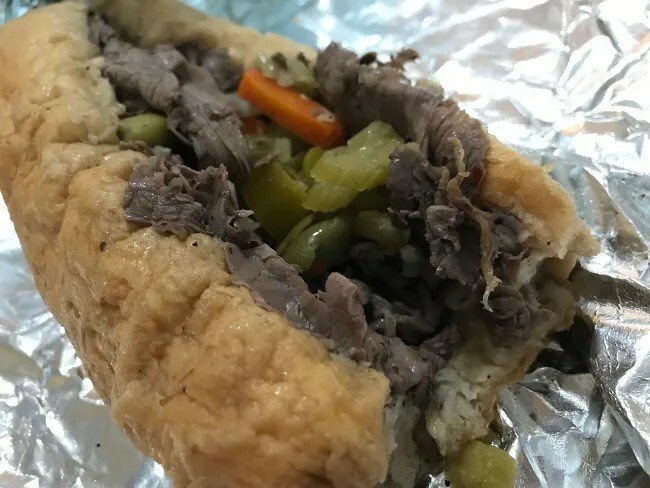 The gravy has a little bit of a kick to and when they “baptize” the beef, the dunk the whole thing in…that’s the only way an Italian beef should be served. The gravy itself has a little bit of a kick to it which is just intensified by the hot pepper mix of carrots, celery, and jalapenos. I got the 7″ on this trip although I can easily put away one of the 10″ sandwiches. I added on a large fry to my order and, honestly, the fries aren’t much to write about. 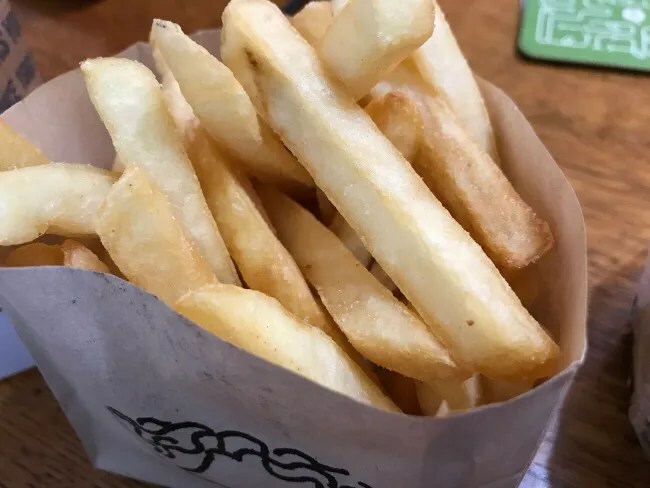 Simple, frozen french fries out of a bag. That’s about it. J doesn’t like beef, but there are a number of delicious salads on the menu as well. For the second day in a row, she ordered the Tuscan Harvest Salad. 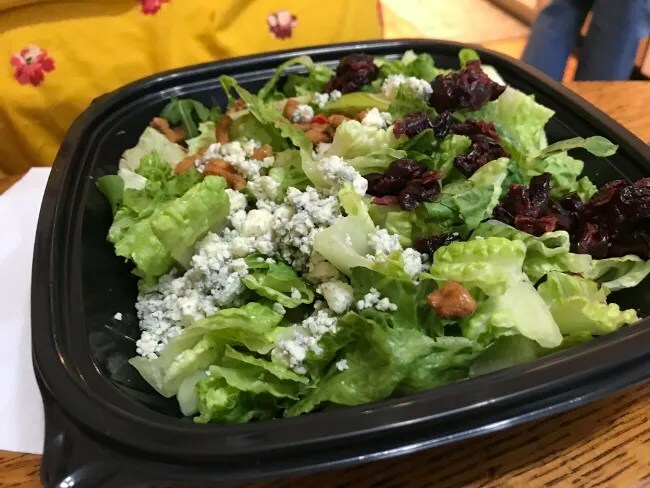 The plastic tray of mixed greens is topped with arugula, Granny Smith apples, dried cranberries, candied walnuts, and Gorgonzola. The salad comes with a Raspberry Vinaigrette. It’s a simple salad but one that J really likes. We usually pick Portillo’s when we do the Chicago food thing because J likes the salads there, but Buona’s salads are just as delicious. The cost of our meal was just over $22. 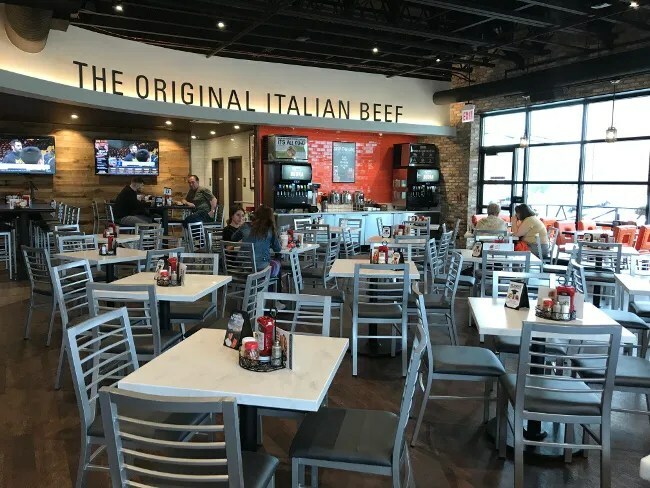 Buona is another one of the great Italian beef places in Chicago and they seem to be getting bigger. 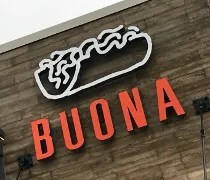 I was just introduced to Buona last summer despite them being in the Chicago area for quite a while. There are so many small sandwich joints in the area but it’s nice to have a quality chain where you know you’re always going to get a quality sandwich regardless of where you are.